We are pleased to announce that Ri-Vista, an international indexed journal edited by Firenze University Press, will publish a special issue based on a selected number of top research papers from the Waste Architecture Sessions / Sardinia 2017. Furthermore, a selection of papers from the International Workshop on Waste Architecture / Sardinia 2015 will be peer-reviewed for potential inclusion in the issue. 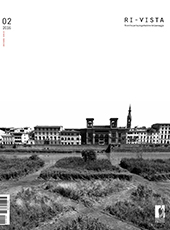 Founded in 2003, in 2014 Ri-Vista was included as one of the scientific journals of the Department of Architecture of the University of Florence, and in 2015 a second series was launched. The journal focuses on Landscape Architecture in a traditional discipline open to contributions from other related scientific fields; it has been consolidated over the years to expand on the main topic to which the journal is devoted. For more details please visit http://www.fupress.net/index.php/ri-vista/index. The paper selection process for potential publication on Ri-Vista will be carried out in September 2017. Following notification, authors of selected papers will be invited to submit their contribution to papers@sardiniasymposium.it no later than 20th November 2017. The paper should be prepared in line with the editorial requirements of the journal.